Screenshot from the Virginia Aquarium and Marine Science Center video. Click to see the video. YOU CAN FIND NUMEROUS VIDEOS OF OCTOPUSES HATCHING ON YOUTUBE (always fun to watch). Here’s a short one from the Virginia Aquarium and Marine Science Center that shows something I’ve never noticed. Immediately after shooting into life, the little guy – a Caribbean reef octopus – turns dark brown as it swims rapidly away. In followup questions, visitors asked whether the mother died (a common aftermath for octopuses and its typical lifespan. 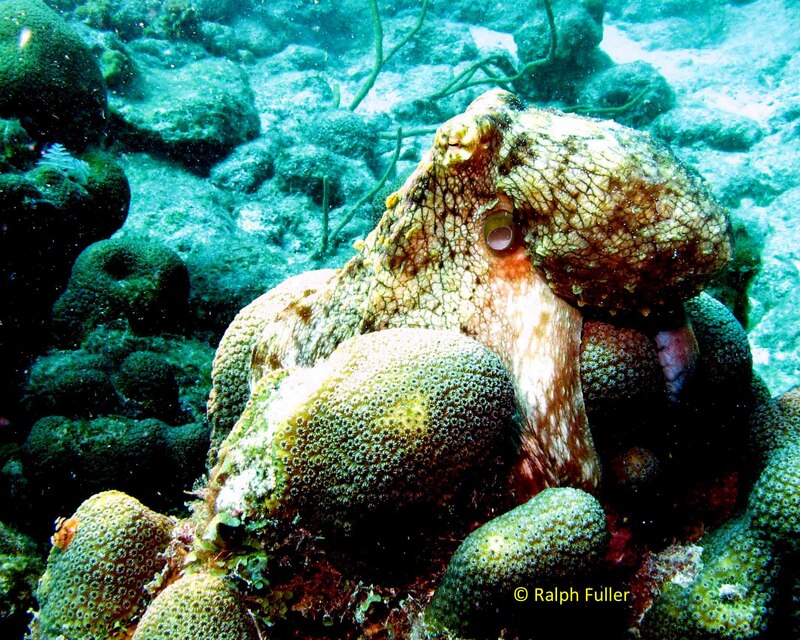 For comparison purposes, an adult Caribbean reef octopus (not from the Virginia Aquarium and Marine Science Center).